A couch and old carpeting were simply dumped in front of a stop sign at Barham Street. Over the years, excavated dirt has been illegally dumped on this lot. People also dump used tires along Barham Street in the MorningSide neighborhood. 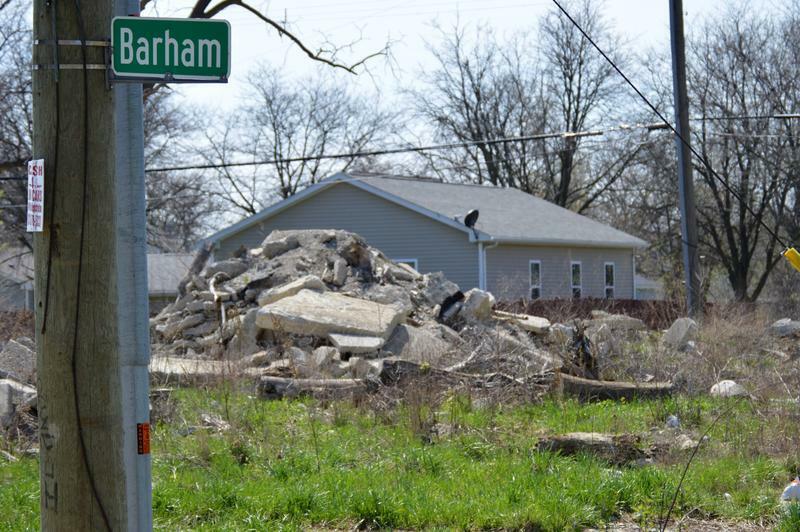 Mountains of broken concrete have been dumped on the vacant lot on Barham Street in Detroit's MorningSide neighborhood. Some people dump large items such as televisions, but sometimes the dumping is just household trash. Illegal midnight dumpers use Barham Street often. Much of the street is vacant lots. This water heater and trash was dumped on Barham just behind two business on Mack Avenue. 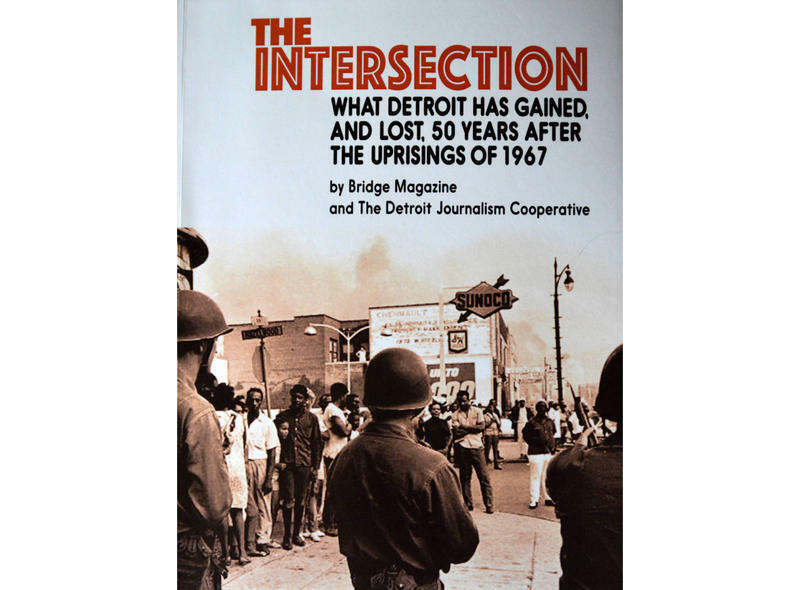 I was recently on Detroit’s east side, driving in the MorningSide neighborhood. Barham Street is a favorite among illegal midnight dumpers. There are a lot of vacant lots along the street. I passed a water heater and other junk along the road. A little farther on, there were several mountains of broken concrete on a vacant lot. A couch and old carpet were dumped in front of a stop sign. This street is odd in that on one side, houses face the street. On the other side it’s garages and backyards. It kind of reminds you of an alley. A non-profit organization known for building affordable housing is based in this neighborhood. Linda Smith is the Executive Director of U-Snap-Bac. She says they’ve been wondering what to do with Barham. Not too long, ago some University of Michigan students examined it. “One of the professors came to me to talk about doing some green, some open lots, some space, some farm way, looking at the possibility of what can we do with Barham,” Smith said. Smith applied for a grant from the Kresge Foundation. Kresge has been running a pilot program. This year it is supporting 17 new projects in the neighborhoods. They include greenways, community hubs, youth engagement, artists in parks, and more. 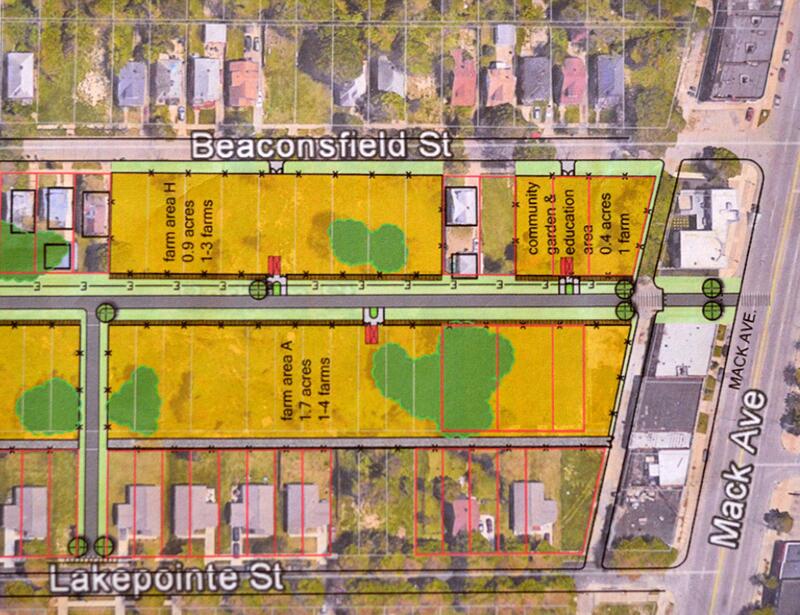 A rendering of part of the Barham Street agricultural greenway plan. It will stretch along five blocks in the MorningSide neighborhood. 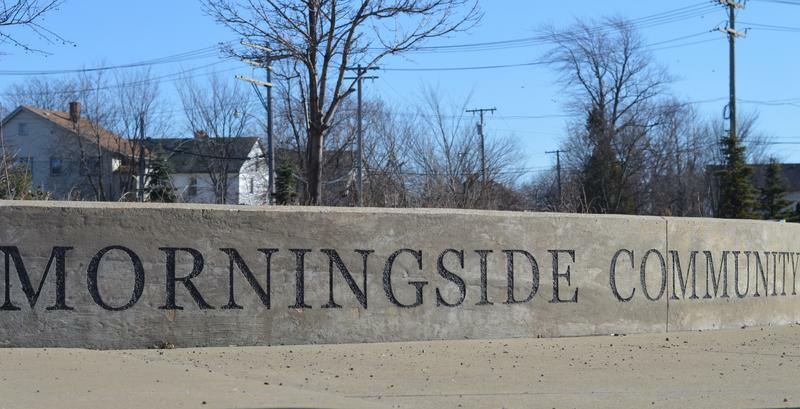 The MorningSide project got $150 thousand of the $2 million given away this year. With the problems many of the neighborhoods in Detroit face, you might wonder why a greenway, why artists in parks? Hogle says the neighborhood groups meet with the residents. Lots of ideas are gathered and they build a consensus. In MorningSide, Linda Smith says people wanted a place to walk dogs, a place for kids to ride their bicycles, and more fresh food. This agricultural green way will do all of that. And it will be self-sustaining. Farmers will lease the land. Smith says there’s demand by farmers who want space to grow food. Linda Smith is the Executive Director of U-Snap-Bac. She applied for the Kresge grant which will help turn Barham Street from a dumping site to an agricultural greenway. “They just want to be able to grow their crop like anyone else. But, they don’t want to deal with the Land Bank. They don’t want to deal with the City. They want to be able to lease land that’s already been prepped to do what they want to do. So, that’s what’s exciting,” she said. I talked with Marvin, who lives next to Barham Street. He did not want to give his last name. “It’s a good idea as long as they keep it clean. And if they plant a garden in there for all the neighbors to participate, it would be a good thing for them,” he said. I explained to him that one of the things they’re talking about is actually leasing it to farmers who would grow crops and then sell them to the neighbors. “That’d be good too. We need something in the neighborhood so people can get more interactive with the neighbors. Yep. That’s what we need,” he concluded. 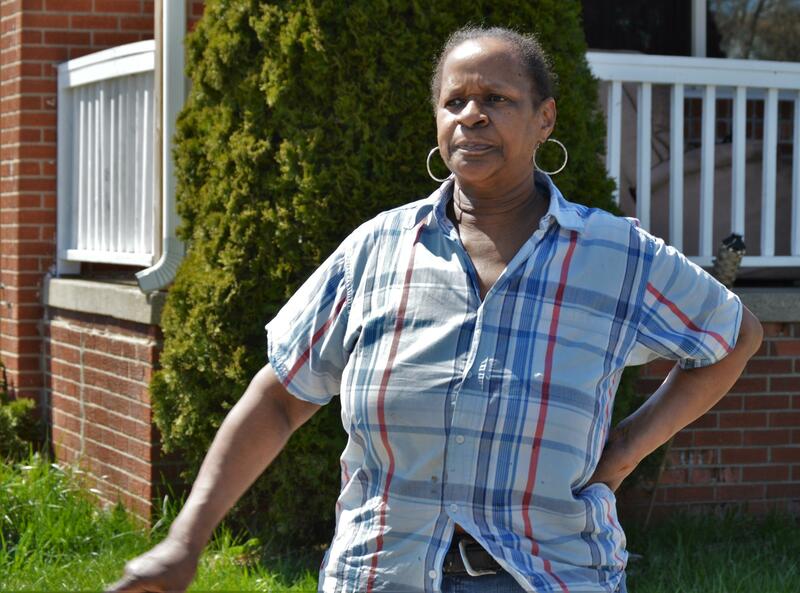 One of the few houses along Barham that faces the street is a neat brick house where Faith Williams lives. She recently bought a vacant lot next door. The Barham greenway will adjoin that lot. Faith Williams lives on Barham Street. The agricultural greenway will include property right next to her home. She likes the plan and wants to help where she can. “That sounds nice to me. That sounds like a very good idea. Yeah. I would even help them, you know, keep the greenery up,” she said with a laugh. Soon, Linda Smith at U-Snap-Bac will be getting some more help to make sure this project is successful. J.P. Morgan-Chase bank will be loaning her four executives for a month. They’ll design a business plan for the agricultural greenway. From Michigan Radio on Vimeo.